You can now use the scanner to mark which barrels in a barrel group are partially full. 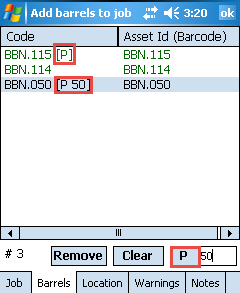 On an associate job you can mark which of the barrels are partial by clicking the ‘P’ button. If you are tracking the exact volume of the barrel, enter in the amount before clicking the partial(‘P’) button. For verified jobs or looking at a Barrel group from the Group search you can determine which barrels are partially filled as there will be an asterisk next to the barrel name.